On April 21 evening, Supreme Court advocate Rashid Rehman Khan in Multan sent this note below to an email list with the subject line, “media campaign by vampires”. He included scans of a report in that day’s daily Khabrain about a press conference by Tehrik-e-Tahafuz-e-Namoos-e-Risalat (Movement to Protect the Honour of the Prophethood), where speakers objected to his attempts to move the case of a ‘blasphemy’ accused teacher whom he was defending, out of Multan. Rashid had earlier succeeded in getting the judge to hear the case in the jail premises rather than the district court where there was pressure from the extremists. On April 10, during a hearing, in the presence of the judge, “three persons including Advocate Zulfiqar Sindhu, in open court” threatened the lawyer (Rashid Rehman)”, according to a Special Branch report which added that ‘vigilance is indicated’. The media is still flaming the issue by reporting baseless and one sided story. The new directive issued by the vampires is that the university administration shall act according to their wishes. 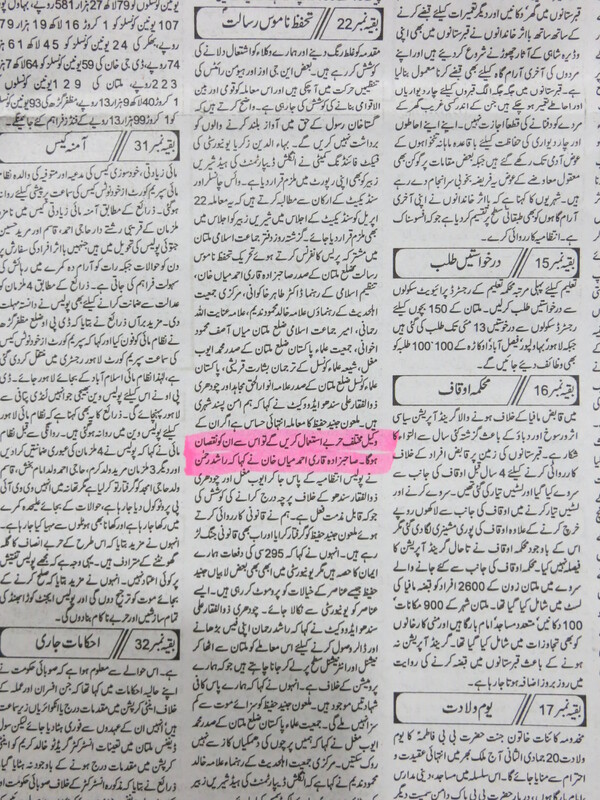 In syndicate of Bahauddin Zikaria University 2/3 members are fanatics. The VC is so weak that he has given jobs to different people at the direction of this group. All the persons sitting have no regular source of income they are not paying any tax to the govt. Now they all have decided to kill me. In case any thing happen to me even accidently all these would be responsible of my murder. HRCP and others had called for protection to be provided to him, but the Punjab government turned a deaf ear. 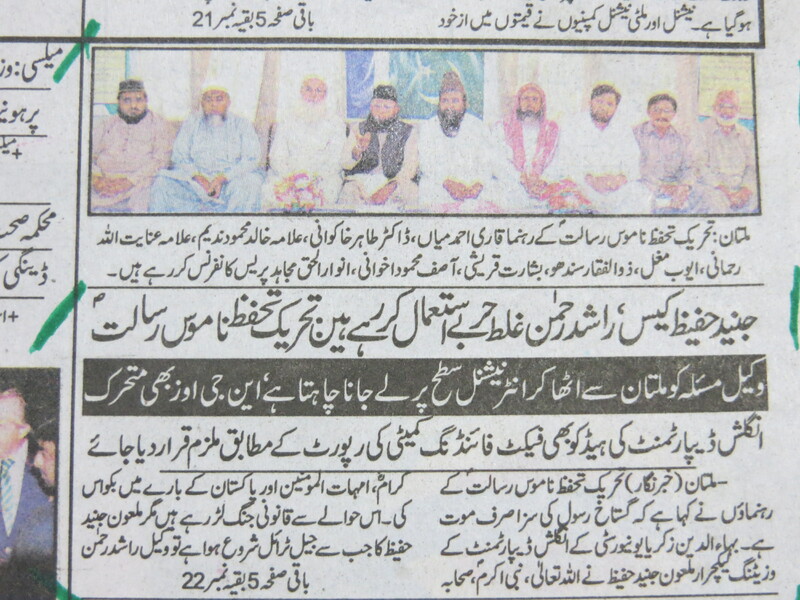 Those who call to muzzle the media somehow never ask the media to be more responsible in how they report “blasphemy” cases. 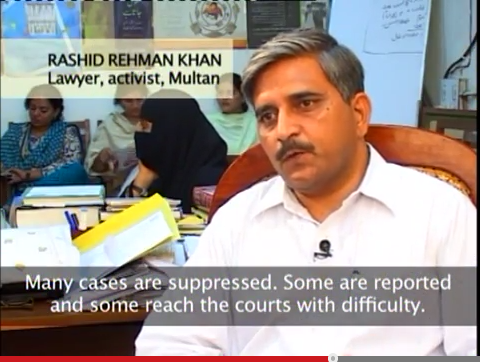 Armed men barged into Rashid Rehman’s chambers a few days later and shot him dead. We have lost a great person a loving person………….. he was my sweet friend and and human rights activist. my heart is bleeding, tears are running. He was the only spoken voice for the indigenous communities in the most poverty ridden area of south Punjab. We miss you Rashid. We all are now your strong voices..